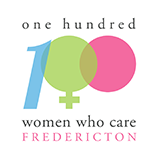 Bringing together 100+ women in the Fredericton area who care about local community causes and donate $100.00 4x/year. Meet for an hour, select a local charity to receive our support. Local women. Local impact.